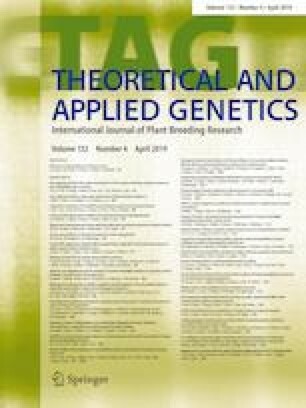 The tomato gray leaf spot resistance gene Sm was fine-mapped in a 185-kb region through a map-based cloning strategy and genome-wide association study; a candidate gene was proved to be involved in Sm-mediated resistance through transient gene silencing. Gray leaf spot, caused by Stemphylium spp., is a warm weather foliar disease in tomato (Solanum lycopersicum L). Resistance against gray leaf spot is conferred by a single incompletely dominant gene (Sm) located on chromosome 11. This study aimed to map and identify molecular marker tightly linked to the Sm gene for the use of marker-assisted selection in breeding. Using an F2 population derived from a cross between the resistant line ‘9706’ and the susceptible line ‘Heinz 1706’, the Sm gene was mapped to a 185-kb interval between two markers, InDel343 and InDel-FT-32 on chromosome 11, which was consistent with the result of a genome-wide association study using 289 diverse accessions. An ORF predicted in this region was proved to be involved in Sm-mediated resistance through transient gene silencing and seems to be a good candidate of the Sm locus. To clone the Sm gene, a bacterial artificial chromosome (BAC) library was screened and one BAC clone B80B15 containing the predicted ORF was identified. The analysis of sequence and structure characteristics demonstrated that the candidate gene was not a typical type resistance gene. Additionally, a co-dominant marker Sm-InDel, which produced a 122-bp or 140-bp fragment for resistant or susceptible alleles, respectively, was developed. This marker was validated in 289 germplasm and could be used in marker-assisted selection for gray leaf spot resistance. Communicated by Richard G.F. Visser. The online version of this article ( https://doi.org/10.1007/s00122-018-3242-z) contains supplementary material, which is available to authorized users. This work was supported by the National Key Research and Development Program of China (2016YFD0101703), the National Natural Science Foundation of China (31471874) and the Key Laboratory of Horticultural Crops Genetic Improvement, Ministry of Agriculture of the People’s Republic of China.